From the commemorative volume presented to Philip Frank Eliot by his parishioners in Bournemouth. This volume [SGC M.884/2] was presented in 1891 to Philip Frank Eliot to mark his appointment as Dean of Windsor. However, rather than a celebration of his achievement, the elaborately decorated gift is a regretful farewell to Eliot from the parishioners at Holy Trinity, Bournemouth, where he had served as vicar for twenty-three years. For the previous five years he had held the post alongside a canonry at St George’s Chapel. Now that he was appointed Dean, however, he was obliged to be permanently resident at Windsor and so had to resign from Bournemouth. This beautiful view of Windsor Castle is one of many drawings in ink, watercolour and gold leaf that illustrate the margins of the presentation volume, which was designed and supplied by Harry Nash of Bournemouth. 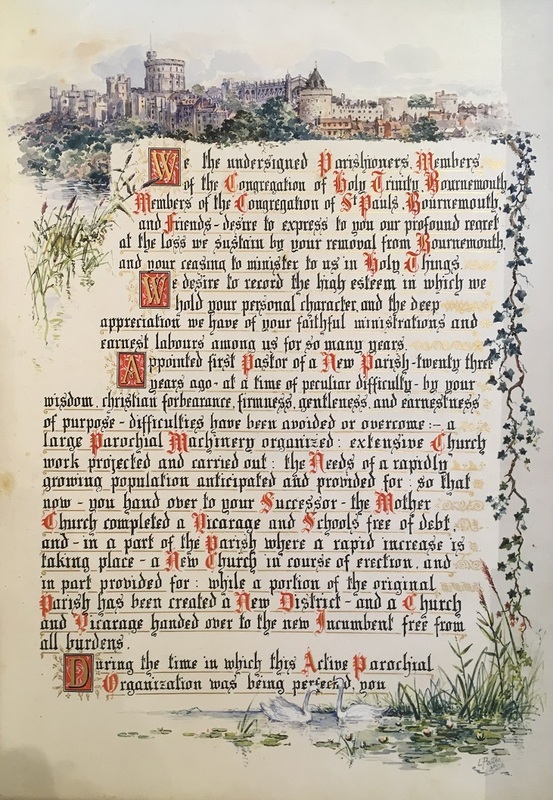 There is also a full-page depiction of Holy Trinity, Bournemouth, by L. Patten, and the hand-written text has been delicately illuminated with red and gold ink. The names of more than seven hundred parishioners are inscribed in the book. Their high regard for Eliot is made very clear, along with their admiration and gratitude for those things which, by his “wisdom, Christian forbearance, firmness, gentleness and earnestness of purpose,” he had done in order to guide the parish through a difficult time in its history, leaving it “free from all burdens” for the next incumbent. Sadly for Dean Eliot, his success and popularity at Bournemouth does not seem to have been matched at Windsor. Although his personal correspondence shows that he was delighted at the special intimacy that his role encouraged with the Queen and the Royal Family, he lacked the dominating personality of his predecessors, Gerald Wellesley and Randall Davidson, and so struggled to govern the Chapter and community. One canon caused him particular difficulty. John Neale Dalton was a fiercely intelligent man and former tutor to two of Queen Victoria’s grandchildren: Prince Albert Victor and Prince George (later King George V). He may well have struggled to come to terms with the appointment of Eliot as Dean over him. Eliot had been a canon of Windsor for less time than Dalton and is reported to have spent most of that time in Bournemouth. Certainly Dalton was not afraid to challenge Eliot in his running of the Windsor Chapter. At times of disagreement, it is certain that the memory of his friends in Bournemouth would have provided great comfort to Dean Eliot.